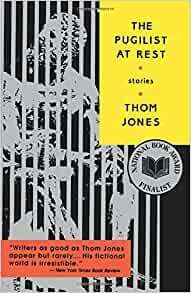 Jones’s stories – whether set in the combat zones of Vietnam or the brittle social and intellectual milieu of an elite New England college, whether recounting the poignant last battles of an alcoholic ex-fighter or the hallucinatory visions of an American wandering lost in Bombay in the aftermath of an epileptic fugue – are fueled by an almost brutal vision of the human condition, in a world without mercy or redemption. Physically battered, soul-sick, and morally exhausted, Jones’s characters are yet unable to concede defeat: his stories are infused with the improbable grace of the spirit that ought to collapse, but cannot. For in these extraordinary pieces of fiction, it is not goodness that finally redeems us, but the heart’s illogical resilience, and the ennobling tenacity with which we cling to each other and to our lives. The publication of The Pugilist at Rest is a major literary event, heralding the arrival of an electrifying new voice in American fiction, and a writer of magnificent depth and range. Two things about this book really stood out to me. The first, is that while this covers ground similar to many other authors (particularly American and male), and has so many influences (Thom Jones said he’d read at least 10,000 books-and I’d bet good money some of them were by Stephen Crane, Charles Bukowski, and Nelson Algren ) this book comes off as fresh and deeply personal. The second standout is while these stories may be bleak and/or violent, the overwhelming emotion I felt after reading them was compassion. Jones’s “outsider” sensibility permeates every story.There’s also some humor. One of the stories (“The Wipeout”) is kind of a sly homage to Nelson Algren (and his affair with Simone de Beauvoir). Jones died in 2016- RIP.